My pick is Heir of Fire by Sarah J. Maas! Lost and broken, Celaena Sardothien's only thought is to avenge the savage death of her dearest friend: as the King of Adarlan's Assassin, she is bound to serve this tyrant, but he will pay for what he did. Any hope Celaena has of destroying the king lies in answers to be found in Wendlyn. Sacrificing his future, Chaol, the Captain of the King's Guard, has sent Celaena there to protect her, but her darkest demons lay in that same place. If she can overcome them, she will be Adarlan's biggest threat - and his own toughest enemy. 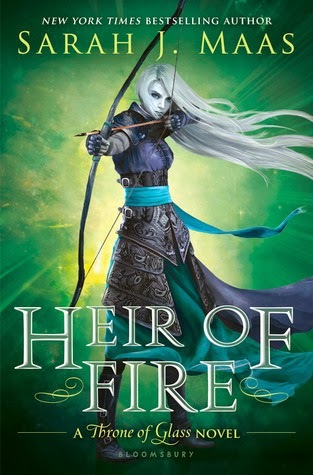 I am totally excited for Heir of Fire - especially since the cover and summary were just recently revealed! I can't wait to read it. I'm hoping we'll get plenty of Chaol/Celaena moments. I loved them in the last book, Crown of Midnight! Heir of Fire releases on Sept. 2, 2014. I haven't read the first book in the series yet, but I'm excited to! This series sounds like something I'll really enjoy. Maybe once this one is released I'll read them all at once. :) Thanks for stopping by my blog!